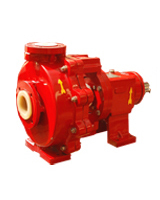 DAYBREAK is engaged in the activity of manufacturing NON-METALIC Chemical Process Pumps by a team of competent engineers with vast expertise in centrifugal pumps technology. DAYBREAK specializes in application engineering of various rotary equipments meant to handle corrosive media. The fluorinated polymers are widely appreciated for their remarkable chemical inertness and their excellent resistance to aging. Polyvinyldeneflouride offer the specific advantage of easy processing in accordances with all the conventional methods used in plastic industry. PVDF, polymerized according to its one special process, offers a high degree of crystallinity to that by other processes, resulting among other things in superior thermomechanical properties. The intrinsic technical superiority is one of the reasons for the success which PVDF has achieved on the world market for more then 30 years. Chemically inert to most acids, aliphatic and aromatic oranic compounds, chlorinated solvents, alcohols, etc. Excellent mechanical properties over a wide range of temperatures tensile yield strength up to 55 Mpa at 23oC and 10 Mpa at 150oC. Abrasion resistance comparable to that of polyamide, and relatively low coefficient of friction. Excellent Thermalaging resistence: tensil yield strength retention over 90% after 25,000 hours at 150oC in a ventilated oven. Continuous use temperature as high as high as 150oC for the homopolymer grades with out mechanical stress. Physiologically harmless and approved for contact with food. Semi-open type impeller. 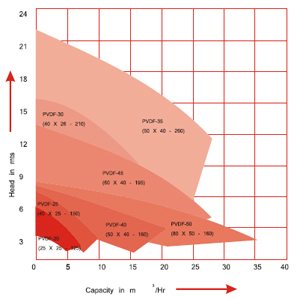 A large metal insert in the PVDF impeller greatly increases mechanical strength. Thick walled casing liner and back plate is made of PVDF Replaceable casing liner Standard shell of Cast Iron Casing Liner and back plate are solid injection moulded. Envelop Gasket (Casing Gasket) is of PTFE with EPDM rubber insert to ensure maximum sealing. All other gaskets are of PTFE. Design is matched to the shaft seal mounting Material used 99.7 % oxide ceramic Al2O3 High Alumina ceramic & Silicon carbide Metal such as hastalloy B/C, Alloy 20, and titanium. Particularly rigid shaft of high strength stainless steel /EN-8, EN-24. Double row ball bearing with extremely high load capacity. Long life oil lubricated bearings on both the sides. 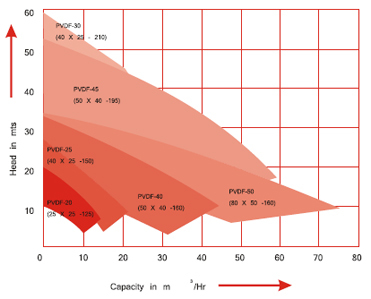 In practice, the theoretical maximum temperature specified by the plastic manufacturers cannot be utilized in the case of heavy-duty hydraulically optimized pump components. Thanks to the encompassing metal armour and large metal impeller core, the PVDF used in DAYBREAK make pumps can be stressed to a relatively high extent with out becoming mechanically over loaded. Flow rate up to 300 m3/hr. Head up to 90 mts liquid column. 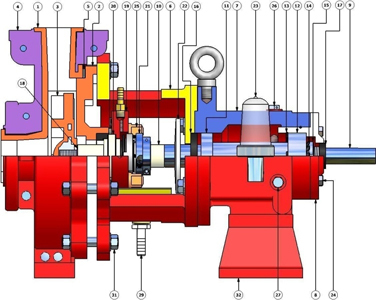 Tried & tested chemical process pump design for rough condition. Thick walled vacuum proof PVDF housing in one piece. Pipeline forces are absorbed by strong cast iron Armor. Available in 1440 as well as 2900 rpm. Back pull out design easy to maintenance. Faster Delivery & Cost Effective. Pickling acid recirculation, Rinse recirculation Span/Waste acid transfer, Fresh acid transfer. Concentrated waste pickle liquor, pickle liquor, Fresh acid transfer. Various kinds of toxic & hazardous chemicals with or without slurries. HCL loading/unloading, Chloride destruction, Anolyte blow down, Drying tower. Acidic chemicals with slurries, Filter press application. Pure to slightly contaminated, Toxic, Explosive or Environmentally harmful media such as acids, alkalis and solvents. Industrial waste water treatment (ETP), Scrubber recirculating. 12 Ball Bearing (Outboard) ZKL - 6306/3310/6311/3313 28 Coupling** C.I. 15 Locknut Steel 31 Casing Hardware S.S.
16* Oil Seal Neoprene 32 Bearing Block Leg C.I.